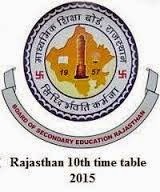 Rajasthan Board of Secondary Education of Ajmer is going to conduct the RBSE 10th / Matric class examination march Date Sheet / Time Table 2015 on the official web portal and at www.aptsmanabadiresults.in. Board of Secondary Education Rajasthan is one of the popular boards of india. Rajasthan Board was established in 1957 in Ajmer. RBSE has many affiliated schools across the Rajasthan State. Rajasthan Board has released the march exam time table online on the url given below. Rajasthan Board Secondary / 10th class Date Sheet 2015 can be download or print from Manabadi Results here below. You can also Download Rajasthan 12th Class Date Sheet / Time Table 2015 at this website. When is Rajasthan Board 10 class exams conducted ? BSER Secondary Exams 2015 dates ? The Exact Dates of the RBSE Secondary Exams 2015 were provided here subject wise and also paper code wise along with the Time of the Examination below. You can check or also you can download the PDF version of the Time Table using below provided link. The Rajasthan Board 10th Class Annual exams 2015 were scheduled from 19 March 2015 to 30 March 2015. The Examinations were started on 19 March 2015, Class X students were appear for English Compulsory (Subject Code: 02) Subject Exam on 1st day and the Last Examination is conducted on 30 March 2015 with the Science (Subject Code: 07) Examination. You can get and Download the RBSE Secondary Annual Exams 2015 Date Sheet / Time Table from below. Then Find your 10th time table in pdf form click on it.